Aimee Bouchard, YPT's Interim Member Schools Manager (second from left), leads a workshop on site-specific theatre for Kingston’s Kick & Push Festival. June 1, 2017 / YPT / Comments Off on Immersing Young Audiences in the World of Theatre – Literally! In April and May, I was incredibly fortunate to have had the opportunity to facilitate some workshops for young people around creating site-specific, immersive theatre. Through these workshops, I too have gained further insight into the form, and particularly why it is that young people are so truly fascinated by it. But first, for those unfamiliar with the term, site-specific theatre takes place in an unconventional space, which has been transformed theatrically. This space is relevant – integral, in fact– to the telling of the particular story. Site-specific theatre often falls under another category called immersive theatre, meaning the audience is “immersed” in the world of the story by physically being in the same environment as the story and its characters. Usually, immersive and site-specific theatre involves audiences wandering around the space (with or without specific direction of where to go next), encountering the world of the story and often interacting with characters along the way. Sometimes, the audience can even have agency within a performance with the ability to affect change or direct the course of the story. In one workshop, I worked with Queen’s University pre-service teachers in the Intermediate/Senior Drama class. We explored ways to approach teaching a unit on site-specific, immersive theatre with their future high school drama students. We had full access to a historic church and used its nooks and crannies to explore how we might uncover with our students the storytelling potential of various spaces throughout. For the Juvenis Festival (Kingston’s theatre festival for youth under 30), I had the chance to work directly with high school students. In both workshops, we ended the day together by creating our own short immersive and site-specific experiences. The pre-service teachers had some familiarity with the form, but I wasn’t surprised to find that it was actually the second, younger group of workshop participants that knew a great deal more about immersive theatre already – many of them had experienced multiple immersive performances and were excited to learn how they could create it themselves. I’ve come to learn that immersive theatre especially appeals to young people, and I have some ideas as to why this might be. I think it is because the form allows its audience to really be seen, heard and to have an impact – all things that young people deeply value, and all which can have an incredible impact on storytelling with, by and for this particular audience. Immersive theatre allows its audience to be seen. The most impactful immersive theatre I’ve experienced acknowledges the presence of the audience – they may play themselves as audience members, or they may even be given a collective role to play in the world of the story, as well as a reason for being there. Audiences are thus often encouraged to move around and interact with both the environment and the characters. In this way, they are looking at the world of the story and the world of the story is looking back. It is this very visceral and personal connection to the story that encourages a strong investment, complicity, sense of imagination and suspension of disbelief that is surprising and thus invigorating to a young audience. 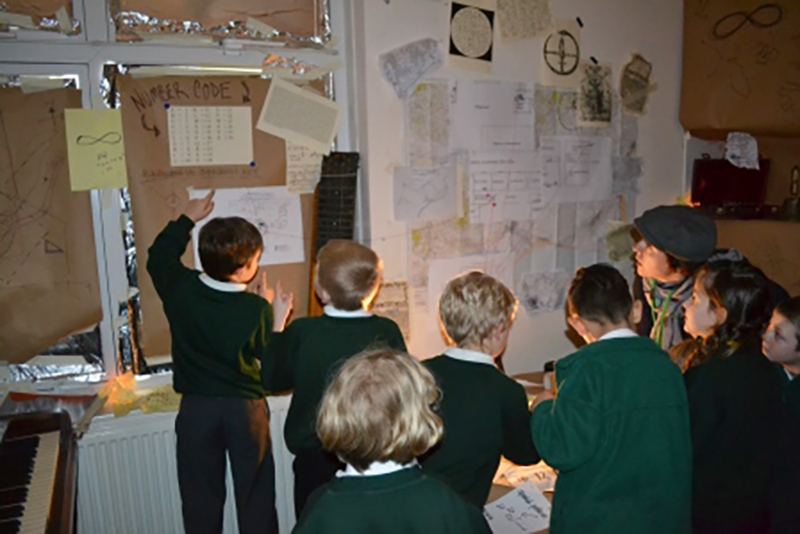 Punchdrunk Enrichment in residence at Hamstreet Primary Academy in Kent, England. Punchdrunk Enrichment in the UK is arguably the leader in the field of creating immersive theatre experiences in both educational and community-building contexts. A couple of years ago, I was fortunate enough to be selected to learn about their ground-breaking approach through a residency in which we worked to create an educational, immersive theatre experience for the students of Hamstreet Primary Academy in Kent, England. One of Punchrunk Enrichment’s latest projects, Against Captain’s Orders: A Journey into the Uncharted, was an immersive theatre production at the National Maritime Museum in Greenwich. It saw young audiences begin their journey on a seemingly ordinary museum school field-trip, led by two “museum curator” characters. While studying various artifacts, the students discover a previously overlooked letter of historical significance, and when the letter and the other archival artifacts they’ve been working with go missing, it propels the students and curators on a journey of exploration through the normally “forbidden” places in the museum: the archives, storage areas and back-offices. In this way, the students more or less play themselves as students, but are asked to take on certain characteristics of explorers and historians in order to successfully retrieve the artifacts. Immersive theatre allows its audience to be heard. Meaningful immersive experiences often involve not only acknowledging the presence of the audience, but also creating space for them to be heard. Audiences are often encouraged to provide their input in order to co-create parts of the experience. Inviting responses to questions like, “What should we do now?” encourages audiences to creatively problem-solve the conflicts in the story. This input from the audience is not only valued, but in fact required, in order to move the story forward. In Against Captain’s Orders, the curator characters are at a loss for what to do and turn to the students for input, asking them to work together to solve puzzles that will bring them closer to recovering the lost artifacts. Against Captain’s Orders: A Journey into the Uncharted – Play by Punchdrunk Theatre Company performed at the Maritime Museum, Greenwich, UK. Sammy Kissin as Glan, Matt Odell as Arthur ©Alastair Muir 14.04.15. Immersive theatre allows its audience to have an impact. In really seeing and hearing its audience, immersive theatre encourages agency amongst its participants. The most meaningful and impressive experiences I’ve had with the form give the audience a reason for being there in the world of the story, and thus a mission, objective or journey that necessarily contributes to the telling of the story. Without the audience completing this objective or journey, the story does not and cannot find its end. In this way, the best immersive stories simply cannot be told without the involvement of the audience, and the potential for them to play the hero and to have an impact on the story places great value on their engagement with the work. In Against Captain’s Orders, the students take on the responsibility for recovering the artifacts and returning them to their rightful place in the museum; without their investment in the story and commitment to overcome the conflict, there would be no story, and no resolution. By the end, the students have not only recovered all the artifacts, but in the process they’ve also helped the curators (and themselves) to understand the importance of being curious and inquisitive and to stop at nothing in the pursuit of knowledge. If you give young people a story that is worth investing in, a rich world to explore, an interesting and challenging conflict, some tools with which to solve it, and time and space for their ideas to be valued and tried out, together they can come up with the most imaginative ideas to contribute to the telling of the story! 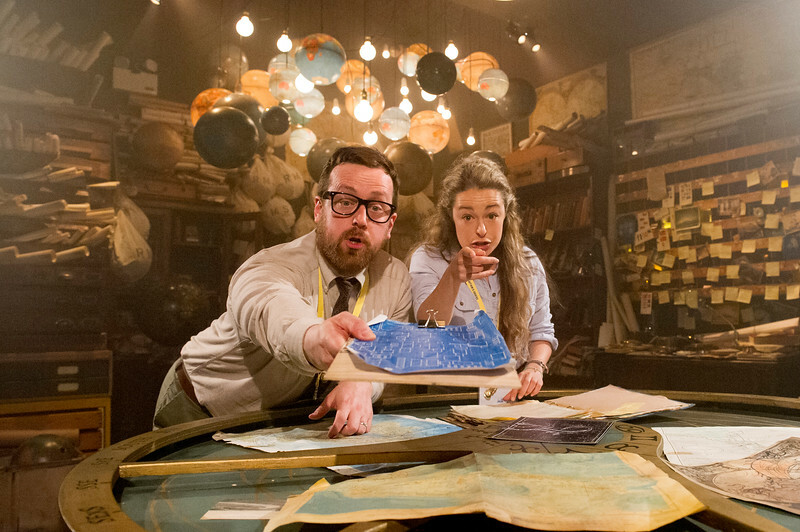 In these ways, immersive theatre presents some new and very exciting implications for what the future of storytelling can be – especially with, by and for young audiences. To actually support young people in their creation of this type of work presents an exciting opportunity for them to create empowering theatre experiences for other young audiences… but that’s a blog post for another day!